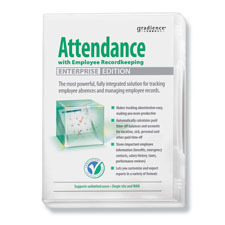 Gradience Attendance with Employee Recordkeeping Software is a time and attendance software combined with a robust recordkeeping solution for a single flexible personnel management solution. The software will automatically calculate time-off balances, vacation, sick, personal and other paid time off for you. The software also securely stores important employee information, such as benefits, contacts, salary history, performance reviews and more. You can also customize and export reports in a variety of popular formats. 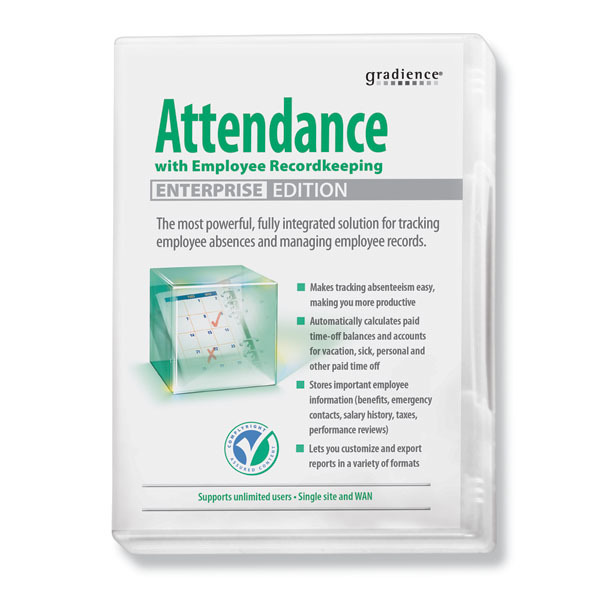 The Enterprise edition offers unlimited concurrent users at a single site, to ensure managers never fall behind in employee attendance tracking. Try it out for FREE with 30 days! Just click “Download Free Trial” to the right or watch a flash demo. Already using Gradience Attendance? Renew your license today! This purchase is for a one year software download license. It requires an annual renewal to continue use.